Earthquakes occur nearly constantly around Europe in countries like Italy, the Balkan States, Greece, Bulgaria, Romania and Turkey. But earthquakes can occur almost anywhere. Italy is a well-known complex territory as far as earthquakes are concerned. Being the result of a collision between Africa and Europe, Italy is highly fractured and broken up into microplates moving all around, which creates a lot of different types of fault action. An earthquake measuring 5.8 on the Richter scale and 6.3 in the moment magnitude scale hit L'Aquila on April 6th, 2009. There have been a large number of minor tremors since December 2008. Along with the stories of tragedy in L'Aquila, there are also stories that the earthquake was predicted, and that the predictions were ignored. Earthquake prediction remains an elusive goal of seismology. Earthquake source mechanisms are complex and involve many variables and factors. Earthquake prediction can be divided into long-, medium- and short-term phases. The short-term prediction of earthquakes has considerable allure. However, it is beset by problems. Although earthquakes are complex multi-scale phenomena, we now have much better models for earthquake nucleation and rupture processes, associated phenomena such as tsunamis, and tools with which earthquakes can be carefully studied from both deterministic and statistical points of view. 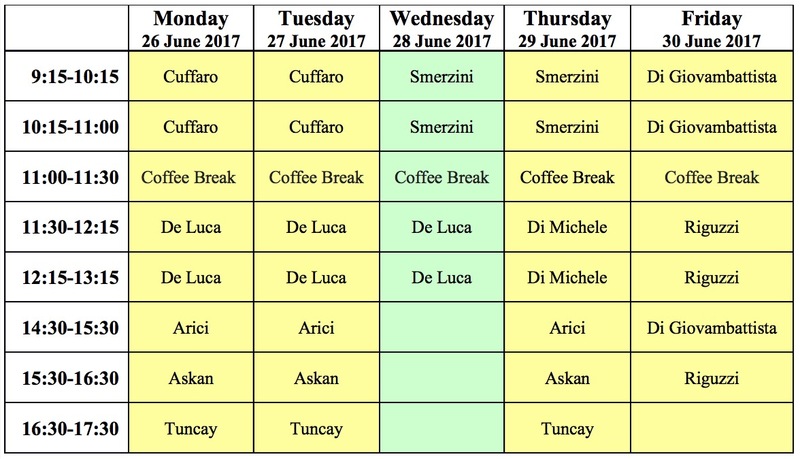 The Summer School called "Mathematical Models in Seismology - SeisMath 2017" will consist of a set of short courses and seminars. Contributors will take into account methods, modelling and simulations related to above mentioned aspects of seismology. Although the need for newly developed mathematical modelling within seismology is very strong, its clear identification as an interdisciplinary research/training context at a European level is still in progress. This programme aims to provide a relevant contribution to this process by exploiting the scientific competencies of the speakers. The short courses will be taught by physicians, geologists, engineers and mathematicians.The programme is addressed mainly to MSc and PhD students in Applied Mathematics. The main goal of structural dynamics is to define the demands on structural systems by discretizing systems’ behavior in terms of systems of ordinary differential equations. The demands on structural systems are usually expressed in terms of various nodes on a system, later used to determine forces or other required quantities. A range of methods have been developed for the solution of the system of ordinary differential equations with the direct integration methods slowly drawing ahead of vector reduction techniques with increasing computational power as the problems of interest are increasingly extreme events with very short durations. The main focus of this short lecture is on presenting the formulation of the seismic shaking problem from the structural engineer’s point of view and outlining the multitude of tools for the solution of structural dynamics of important structures. The principal vibration problem from the earthquake perspective is introduced. Modal solutions as well as direct integration techniques are discussed with the physical definition of the vibration as well as the numerical aspects of the solution. Time domain and frequency domain solution techniques for the set of equations are explained with a special focus on the soil-structure interaction problem. Special techniques for the solution of the problem using the Ritz vectors are introduced. In conclusion, the wide array of options for solving the structural vibration problem is going to be reviewed in this short lecture with the goal of providing the a glimpse to the physical aspects of the vibration behavior of different systems during earthquake excitation. Risk mitigation in urban regions starts with identification of potential seismic losses in future earthquakes. Estimation of seismic losses concerns a wide range of authorities varying from geophysical and earthquake engineers, physical and economic planners to insurance companies while the process naturally involves inputs from multiple disciplines. In this study, different aspects of the earthquake loss problem will be presented along with the mathematical models involved. The main components are: the inverse and forward wave propagation models, building fragility models and loss functions. Each stage involves mathematical modeling with well-defined input parameters regarding the physical process involved. In this seminar, description of the multiple stages of the algorithm will be presented followed by a case study. The study areas for the applications presented in this seminar are the Los Angeles basin, L'Aquila (Italy), Duzce and Erzincan regions (in Turkey). Plate tectonics is the first evidence of the continuous evolution of the Earth's surface. Kinematics at plate boundaries provides main indications on the mechanisms of tectonic processes and their direct consequences such as volcanism and earthquakes. Plate kinematic models represent the basics and the initial conditions for mathematical and numerical modelling of the lithosphere evolution and lithosphere/mantle interactions. Here, we will focus on plate motion modelling and quantitative techniques used to find plate kinematic parameters and to define reference frames. Obtained plate motions will be used to model lithosphere dynamics. Examples at different geodynamic realms, such as mid-ocean ridges, transform faults, and subduction zones will be shown. These suggest that comparison with current seismology at plate boundaries is very often a key point to validate and calibrate mathematical modelling of global scale geodynamic processes. (1) Chouet B., Saccorotti G., Martini M., Dawson P., De Luca G., Milana G., and Scarpa R. (1997). Source and path effects in the wavefields of tremor and explosions at Stromboli Volcano, Italy. Journal of Geophysical Research 102, 15129-15150. (2) De Luca G., Del Pezzo E., Di Luccio F., Margheriti L., Milana G. and Scarpa R. (1998). Site response study in Abruzzo (Central Italy): underground array versus surface stations. Journal of Seismology 2, 223-236. (3) Villaseñor A., Benz H. M., De Luca G., Filippi L., Patanè G., Scarpa R. and Vinciguerra S. (1998). Three-dimensional P-wave velocity structure of Mt. Etna, Italy. Geophysical Research Letters 25, 1975-1978. (4) Chouet B., De Luca G., Milana G., Dawson P., Martini M. and Scarpa R. (1998). Shallow velocity structure of Stromboli Volcano, Italy, derived from small-aperture array measurements of strombolian tremor. Bulletin of the Seismological Society of America 88, 653-666. (5) De Luca G., Scarpa R., Filippi L., Gorini A., Marcucci S., Marsan P., Milana G. and Zambonelli E. (2000). A detailed analysis of two seismic sequences in Abruzzo, Central Apennines, Italy. Journal of Seismology 4, 1-21. (6) De Luca G., Marcucci S., Milana G. and Sanò T. (2005). Evidence of low frequency amplification in the city of L’Aquila, Central Italy, through a multidisciplinary approach including strong- and weak- motion data, ambient noise, and numerical modeling. Bulletin of the Seismological Society of America 95, 1469-1481. Earthquake catalogues are widely used in seismological studies for evaluating and testing earthquake forecast models and hazard analysis. The validity of these studies however strongly depends on the accuracy and homogeneity of the analyzed data catalogs. We will address important issues related to quality control of the data reported in the catalogs, as event location accuracy, magnitude homogeneity and assessment of the minimum magnitude of completeness. These analyses must be performed before attempting to investigate statistical properties of seismic sequences or precursory phenomena. Quantitative laws established empirically, but also theoretically explained can describe the temporal-spatial distribution of the seismicity. We will have an overview of the empirical laws that describe mainshock-aftershocks sequences as the Gutenberg–Richter relation describing the earthquake frequency–magnitude distribution, the Omori–Utsu law characterizing the temporal decay of aftershock rate and Bath’s law for the difference between the magnitude of the largest aftershock and a mainshock. Current research in seismicity patterns that can precede large earthquakes will be described, including examples of multidisciplinary approaches incorporating observations and modeling of different geophysical parameters. It is well known that the fault zones are able to trap seismic waves and act, in some sense, as a wave-guide. Starting from the analytical results obtained by Y. Ben-Zion in the two-dimensional case for the scalar wave equation, we first introduce some mathematical and numerical tools which are able to describe the wave propagation in the fault zones. Then, we discuss how these zones modify the wave propagation during an earthquake. Finally, we present some examples related to the earthquake in L'Aquila. Space geodetic techniques are now primary tools to study the size, figure and deformation of the Earth. They have a great impact in many scientific disciplines, especially in geodesy, geodetic astronomy and geodynamics. The current generation of navigation systems, the so-called global navigation satellite system (GNSS), in which the GPS represents the best known system, has also an important impact on the society as a whole: it revolutionized surveying, timing, and pedestrian, car, marine and aircraft navigation. These observations allow to study a large spectrum of geophysical phenomena at different scale: from the motion of tectonic plates at global scale to the fault motion at local scale, allowing the study of the effects generated by the occurrence of significant earthquakes. We will focus onto two different scales: the realization of global plate kinematics models and the measure of deformations due to the recent earthquakes occurred in central Italy, both making use of the capabilities offered by space geodetic methods. The course aims at illustrating the classical theories of seismic wave propagation and providing the basic tools for the elaboration of numerical methods in elastodynamics, with application to the simulation of real earthquakes. The general problem of seismic wave propagation in elastic continua will be presented, discussing the solution of the wave equation, first, in homogeneous unbounded and bounded media and, then, in heterogeneous stratified media, with emphasis on site amplification effects. An introduction to advanced numerical techniques for the solution of the elastodynamics equation will be also provided, referring, in particular, to the computer code SPEED, based on the Discontinuous Galerkin Spectral Element method. As a challenging application of such method to earthquake engineering problems, the physics-based numerical simulation of the April 6th 2009 L’Aquila earthquake, based on a large-scale computational model including the seismic fault rupture, the propagation path in heterogeneous Earth media and complex geological structures, will be shown. Wave propagation in porous media is of interest in various diversified areas of science and engineering. The theory of the phenomenon has been studied extensively in soil mechanics, seismology, acoustics, earthquake engineering, ocean engineering, geophysics, and many other disciplines. This lecture presents a general survey of the literature within the context of porous media mechanics. Following a brief review of the Biot's theory of wave propagation in linear, elastic, fluid saturated porous media which has been the basis of many analyses, we present various analytical and numerical solutions obtained by several researchers. Biot found that there are two dilatational waves and one rotational wave in a saturated porous medium. It has been noted that the second kind of dilatational wave is highly attenuated and is associated with a diffusion type process. The influence of coupling between two phases has a decreasing effect on the first kind wave and an increasing effect on the second wave. Procedures to predict the liquefaction of soils and extensions of Biot's theory to unsaturated soils are discussed. The lecture includes a brief review of volume averaging theorems which are essential in the homogenization process to obtain macroscopic constitutive relations and governing balance equations. Theorems for volume average of gradients and volume average of time derivatives are presented. Volume averaging theorems are then applied to wave propagation in fractured porous media saturated by two immiscible fluids based on the double-porosity approach. Effective stress principle which serves as a closure condition is elaborated and a derivation for fractured media is presented. Registration is now open! Use the form below to sign up. Can't view the form properly? Open it in a new window. Other participants. The closest hotel to the GSSI institute is the Hotel San Michele. For reservations and for other nearby options, just visit Booking, Trivago, Tripadvisor and other accommodation search engines.